With the classic text of Gustave Flaubert as its starting point, this multi-channel installation is scheduled for exhibition internationally from early 2014. 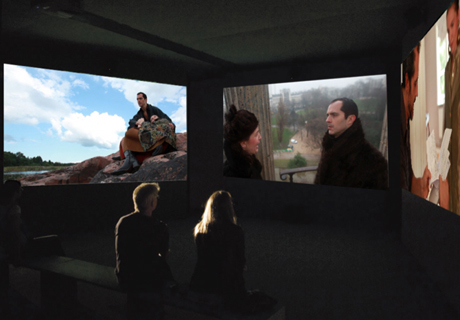 A work about the link between capitalism and romance, Mieke Bal and Michelle Williams Gamaker’s revisionist take on the 19th century novel was filmed in Åland, Finland in summer 2012 and Paris, France in winter 2013. The installations bring together the brilliant talents of actors Marja Skaffari, Thomas Germaine and Mathieu Montanier and many others. By creating deliberate anachronism and intertextuality, the work attempts to show how Flaubert was in many ways a post-modernist and feminist. It explores the way dominant ideologies – specifically capitalism and its association with emotions, and romantic love with its commercial aspects – are still dominant after 150 years. The Madame B. installation offers a radically new interpretation of the text, replete with powerful symbolism that evokes this reimagining. In this way, it questions visually the role of women in a society driven by masculine impulses. The installation pieces explore different visual modes, and demonstrate how these have themselves the power to create an immersive experience. The descriptions of the installation works corresponds with a brochure on the project we have made. The entire brochure is available for potential takers of the project.